The Royal Palace Ubud or Puri Saren Agung Ubud Bali is a beautiful palace, has magnificent architecture, and still maintained until now. The palace (puri) was built during the reign of Ida Tjokorda Putu Kandel (1800-1823). This palace was opened to the public since the 1930s, on the governance of Tjokorda Gede Agung Sukawati (1910-1978), the last ruling monarch of Ubud. 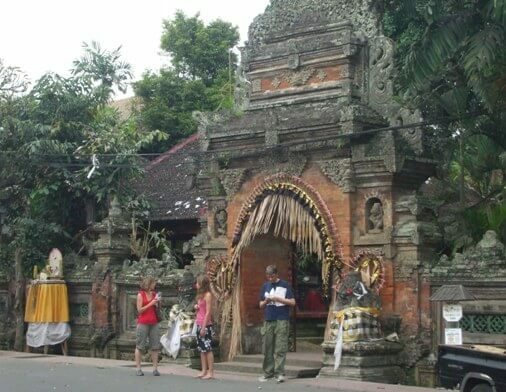 The palace is located at the intersection of Jalan Monkey Forest and Jalan Raya Ubud, across from the Ubud Art Market. Ubud area has a tropical cool climate, regarded as the cultural center of Bali; there are many artists' workshops, galleries and museums. The existence of Ubud today can not be separated from the journey of Hindu priest, Maha Rsi Markandhya, in the eighth century. After successfully establishing Besakih Temple and implementing Shiwa-Buddhist religions (Hindu-Dharma), the priest continued his journey towards the Campuhan area. He arrived on a small hill called Gunung Lebah, in the vicinity there are two streams. In the east there is Tukad Yeh Wos Tengen; while in the west is Tukad Yeh Wos Kiwa. Both these rivers converge in the southern part of Gunung Lebah, and this region is called Campuhan (Mixing). 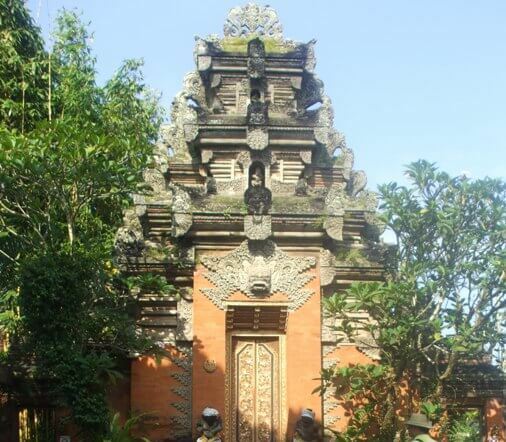 Here, Maha Rsi Markandhya establishing the Pura Gunung Lebah, holy shrine for meditates and gives religious guidance. The word "Wos" or "Uos" is mentioned in the Lontar Markandhya Purana, which is "Wos or Uos ngaran Usadi, Usadi ngaran Usada, and Usada ngaran Ubad". From Ubad (Medicine) and then transcribed into "Ubud". Then in 1343, Javanese Majapahit conquered Bali marked with a victory against Pejeng Dynasty in Bedulu, just to the east of Ubud. Subsequently in 1900, Ubud became a Dutch Protectorate at its own request, and the colonialists interfered little. It is allowing the traditional arts and culture of the area are remain relatively unchanged. When Ubud was opened in the 1930s, foreign artists were encouraged by the royal family to stay in the town. From Ubud, the artists such as Walter Spies and Rudolph Bonnet play an important role in promoting an understanding of Balinese art and culture worldwide. Visitors can see the entrance gate or Candi Kurung, unique and beautiful (the top slit is curved-shaped). It has a harmonious blend between the bricks and ornate motifs carved on it. This candi kurung is quite thick; the top is equipped with motif of Karang Bhoma, or also commonly called a head of Kala (Kalamakara). Go deeper toward the gate into the courtyard, an open space, there are several bale (traditional stone pavilion) and also magnificent Kori Agung. Back in the 1930s, the palace also was one of Ubud's first hotels. 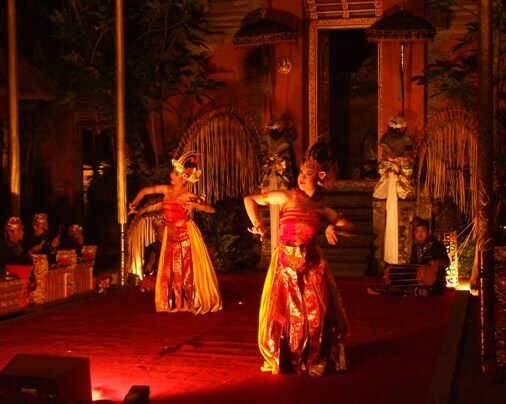 Nowdays, to keep the preservation of the performing arts, the palace holds nightly performances of traditional Balinese dance and Gamelan music in its courtyard. Although Ubud has grown rapidly, visitors can still enjoy the terraced rice fields along the rivers. 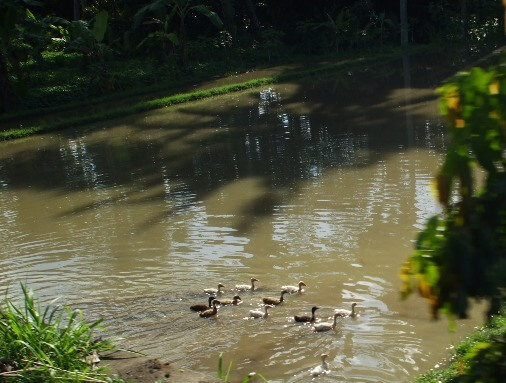 If lucky you can watch the floating ducks, swim in the rice plots. Farther away from the city center, the atmosphere and rural life are relatively undisturbed.